Have you ever felt like your whole world was ending? I have. I have had some life experiences that were so stressful to me that I felt like I was being crushed. And yet, those challenging times have also proven to be the times in my life when I have experienced the most radical spiritual growth. This truth is what drew my attention to the quote in the graphic above. I wonder if the caterpillar really feels that way as it is wrapping itself in its cocoon. It cannot know that the very thing that is crushing it is actually causing it to be wonderfully, radically transformed. I have always been intrigued by caterpillars and butterflies. 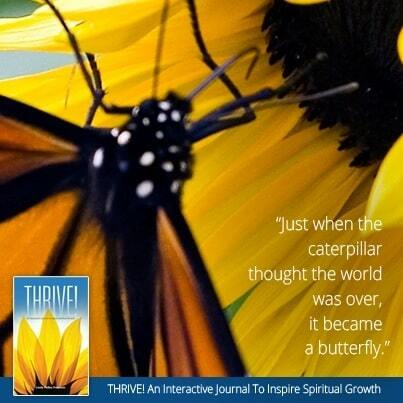 However, I never understood that the metamorphosis from caterpillar to butterfly was so traumatic. In an August 2012 article in Scientific American Ferris Jabr writes that “to become a butterfly, a caterpillar first digests itself. But certain groups of cells survive, turning the soup into eyes, wings, antennae and other adult structures.” Scientists believe that the remaining cells retain not only the information needed to form the butterfly but also the memories of the butterfly’s former life and transformation process. I believe that God created the butterfly to encourage all of us. Just as God designed the process of metamorphosis for the caterpillar, He designed a process of life experiences for us to be radically, spiritually transformed. Like the caterpillar, the very thing that I believe is crushing me is actually causing me to be radically transformed for the good. So how can I change my response to challenging life experiences? How can I learn to embrace them as part of my metamorphosis? What are your thoughts?